There were violent scenes on Sunday night in the Macedonian capital Skopje. Protestors threw flares, rocks and bottles at police outside the national parliament and chanted "Macedonia, Macedonia." Officers responded with tear gas and flash grenades. 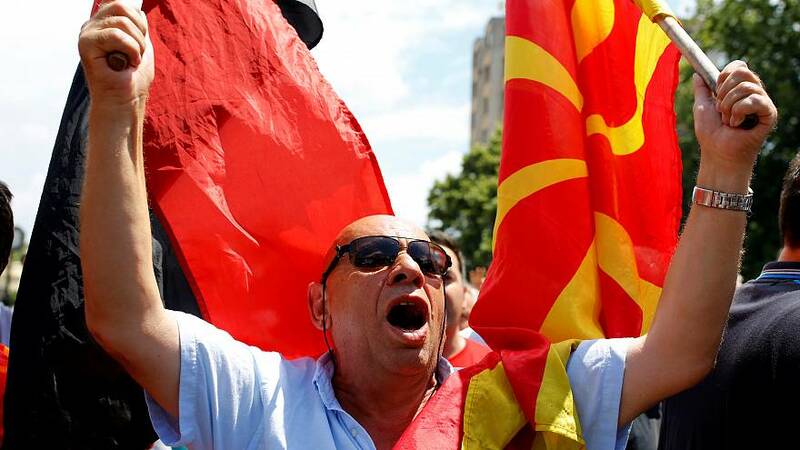 The demonstrations are a result of a deal with Greece to change the name of the former Yugoslavian republic to the "Republic of North Macedonia". For 27 years Greece has argued that by using the name Macedonia the country was laying claim to a northern Greek province of the same name. The dispute has held up Macedonia's entry to the European Union. The deal to change the name was signed by two nations' foreign ministers on Greece's northern border on Sunday, witnessed by the leaders of both countries. Under the agreed terms, once the deal is fully cleared in Skopje, Greece will lift all objections to the renamed nation joining the European Union. But the accord still needs the approval of both parliaments and a referendum in Macedonia. Nationalist objections on both sides mean that approval is far from certain. Why does Greece accuse Russia of meddling over FYR Macedonia?